The planning application to develop St John’s Church into 13 apartments was approved by Cheshire East Council Northern Planning committee on 20th October 2010. Work started by clearing that part of the graveyard that is to become the car park. Then all work ceased for many months. On 3rd February 2012 they blogged on why there is no progress on any of their local sites . In 2017 the situation remains much the same. Gravestones at the front of the church have been moved, to make room for the planned car park. Work has not commenced inside the church as yet. 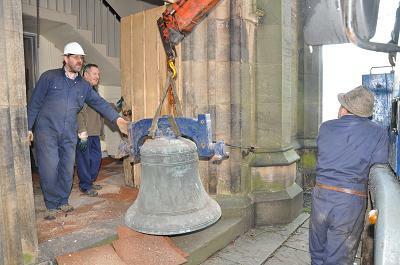 Celebratory final peal of St John’s Church Bells! 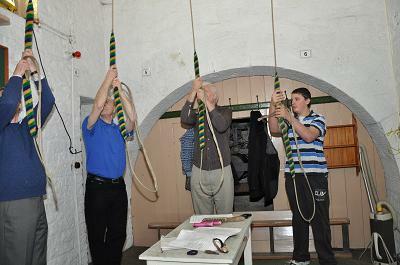 There was a final chance to ring the bells at St John’s Church on Saturday and Sunday 15th/16th January. The Vicar of Bollington, Revd Veronica Hydon, suggested that the peal be rung in honour of St Agatha, who is the patron saint of bell foundries and also of people suffering from breast diseases: so the proceeds of the event, a wonderful £424!, have been split between the Stockton Heath church funds towards the re-homing of the bells (£212) and the Breakthrough Breast Cancer charity (£212). St Agatha’s feastday is actually 5 February, but the final peal had to be before that as the bells are being removed in the week beginning 17th January 2011. The church was crowded with those who wished to hear this historic peal one last time. During the following week the eight bells were dismounted and lowered to the ground. They were taken, together with their metal hanging frames, to the J Taylor & Co Foundry in Loughborough where they were cast 130 years ago in 1880. They were stored until the church in Stockton Heath, near Warrington, was ready to hang them once again. They have now been re-hung and commissioned to ring out once again. It was in Spring 2003 that an article appeared in Bollington Live! about the threatened closure of St John’s church on Church Street. Our worst fears came to pass and the building has remained empty and unused since the end of May 2003. That article ended with the suggestion that the future of the church and the graveyard was a project that the Civic Society should tackle. Bollington Civic Society considered that it was time for the local community to come together to try to formulate a plan of action that would resolve the issues, before the building deteriorated further, or was vandalised, was the subject of a fire or was developed by a private developer in a way that the community did not want. By 2010 we have been unable to find any satisfactory financially viable use for the building and are supporting the proposal by the Simply Group to converting it for residential use. The Church Commissioners now have one offer which proposes just that and have approved their Pastoral Scheme procedures to enable a sale. 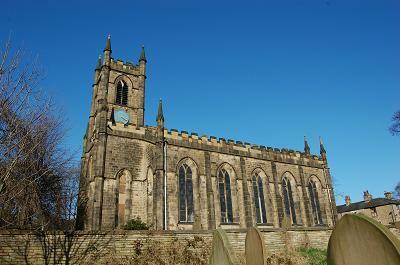 The Grade II listed building of St John’s church stands on a steeply sloping site on the easterly side of Bollington. This is a Commissioner’s church built 1832-4 by Hayley and Brown on land given by local MP William Turner of Shrigley Hall. The basic style is simple and consistent.The walls are pierced by large regularly space pointed lancets and splayed reveals. It comprises a five bay nave with a shallow projecting sanctuary and west tower. The parapets are continuously embattled around the church and, the typically small, three stage west tower. Externally the building is unchanged but the interior has been altered on a number of occasions during the church’s history and little of the original interior survives. A Pastoral (Church Buildings Disposal) Scheme dated the ninth day of December 2010 authorised the Church Commissioners to sell the closed church building of Bollington St John and part of the churchyard for residential purposes. There are burials in the churchyard. The Secretary of State has been asked to make an Order lifting the requirement to remove human remains buried in the building and land, and they will remain undisturbed. The Bishop of Chester has directed that the tombstones, monuments and memorials in the building and land affected by the Scheme shall be removed to a new location within the retained churchyard. You can obtain details of these arrangements and the rights of personal representatives or relatives of deceased persons interred in these graves or commemorated by the tombstones, monuments or memorials from the Commissioners (contact details below) or inspect them at Bollington Public Library until 21 January 2011. If you wish to exercise such rights you must give notice to the Commissioners at the address below by 21 January 2011.